Portable ultrasounds have different applications for different reasons and doctors. What is something to one may not be the same for another as we have come to know it through life experiences. Over the years, we see the depth of portable ultrasounds. Some may ultimately target applications with higher reimbursement levels, others with the size of the machine, latest trends and uses, functionality, ease of use, warranty and yes, affordability. Over the past few years, we know the major players in the portable ultrasound market and learned their niches. An example would be the Sonosite M-Turbo – can you remember the target market? It was MSK/musculoskeletal and Sonosite’s marketing strategy played it hard. The Philips CX50 targets cardiac echo, and now with 3D, not everyone has the budget for the price point or needs 3D. The GE Vivid e (basic cardiac) to the Vivid i (more bells and whistles) to the new Vivid i/q with what appears to be somewhat of a flip-swivel monitor. But now we finally have a new player in the game. Ok, well not new but introducing a new machine that, to me, has finally made it competitively and surpassed their previous models in more ways than one. This new model has many good attributes and just passed FDA approval so it’s ready for sale. 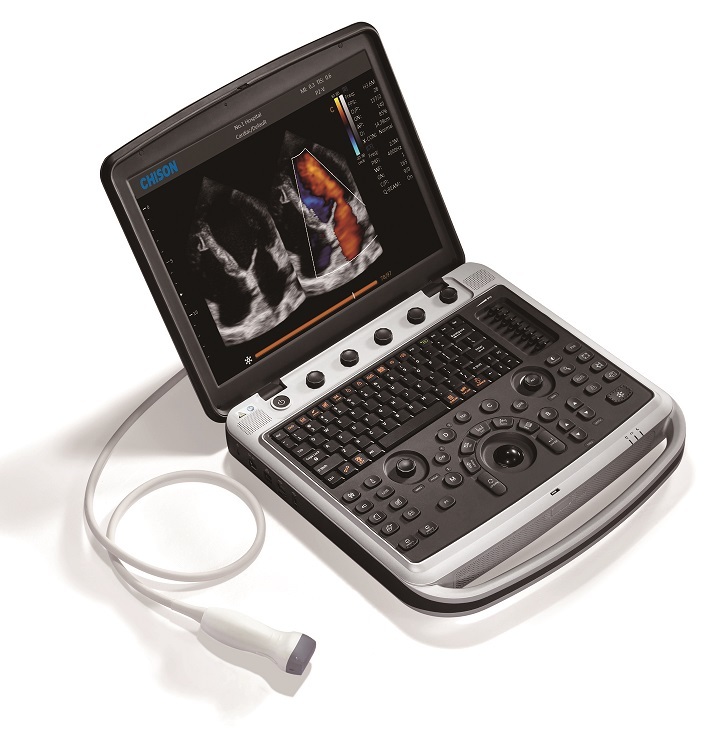 Introducing the Chison Sonobook 9 which has already been tested by local cardiologists and favored. The image is clear and good, the features are in abundance, the size is that of a laptop style, the warranty is 3 years which is very competitive in the market with service available in the US. Some key points to compare against other new portable ultrasounds are: it offers TEE, Stress, 4D, Imaging Enhancements, Breast Imaging, Elastography, OB/Gyn, Human and Veterinary versions and a host of other features and benefits you can view in the video; the unit has depth in character. Does this portable have 4D? Yes, it offers 4D imaging to complement any ob/gyn professionals or prenatal imaging needs. It has 4D software and a 3D/4D convex transducer. How is the imaging on this new portable ultrasound? You can see for yourself on the ultrasound video that is attached. When a local cardiologist demoed the ultrasound scanner in his office, he liked it and was comparing it to the Philips CX50 and the GE Vivid I and i/q models. It also just implemented improvements in its vascular application for better imaging. So, I would have to say you will be pleased. How big is the portable? It’s in the laptop portable category and would compare in size to the Mindray M7, GE Logiq/Vivid series and some Terrason models. Chison took many recommendations from the market to manufacture a more condensed portable while maintaining great imaging. What are the probe options for future expansion? Yes, it has Dicom and it works well. Does it have a High Frequency Linear Probe? Yes, it does have the higher frequency linear probe for MSK and applications that require more superficial imaging while delivering great imaging results. Is this an FDA approved ultrasound machine? Yes, we have the FDA certifications of approval on this unit so you can purchase for human scanning in the United States or elsewhere. FDA is a process that manufacturers go through in certifying their equipment for resale in the US. Enterprise Ultrasound can also offer this SonoBook for Veterinary Professionals who seek new, cutting edge technology in a quality portable ultrasound. Can we finance the new machine through you? Yes, We can offer leasing and loan programs to match your facility/business needs. If you have additional questions or want to see an online demo for your facility, practice, profession, email us at [email protected] Look for extensive detail and images at enterpriseultrasound.com for the Chison SonoBook 9.